The sculptor and monumental mason J. E. Hinchliffe – ‘Hinchliffe of Hampstead’, as he lived in that part of London for most of his long life, was the chief assistant to John Flaxman for the two decades before the latter’s death. In the established custom, after his master’s death, Hinchliffe completed some of his unfinished works. Hinchliffe exhibited at the Royal Academy from 1814 through to 1847, almost 40 works all told. These were mainly groups of classical subjects with long titles, but also a few busts, before he turned almost entirely to works for church monuments after about 1821. His monumental work tends to be modest, simple plaques, or bas reliefs with mourning girls and urns, though he made at least some complete figures in marble. He was praised for his 'purity and simplicity of style'. Hinchliffe of Hampstead sculpture . Examples of his monumental work may be seen at Canterbury Cathedral, Chichester Cathedral, and, for example, in St Anne’s church in Lewes. 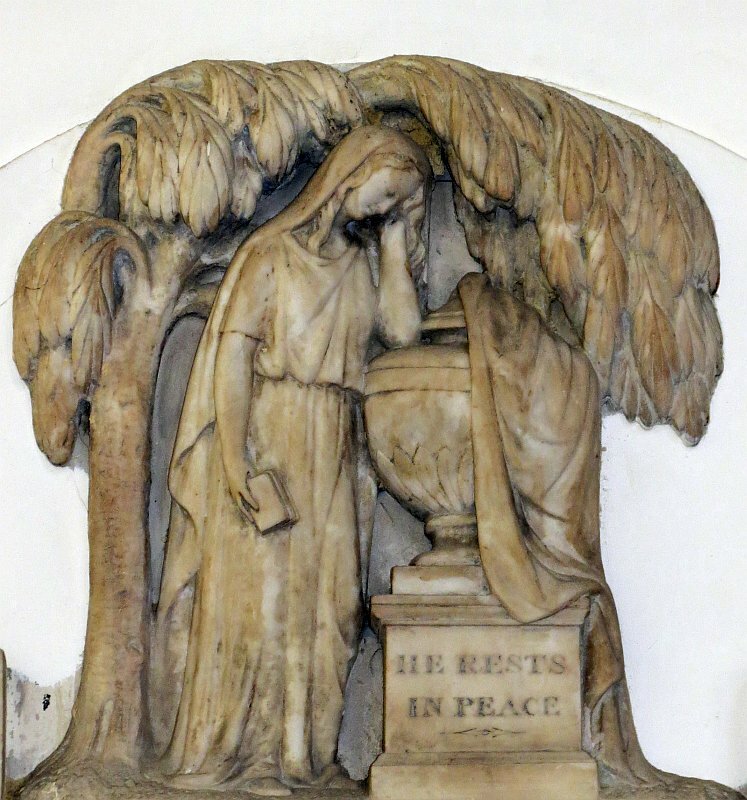 In West London a rather humble monument by him is in Ruislip Parish Church, and an example by him of a girl with a funereal urn is in St Mary Magdelene, Bermondsey (Ralph Page monument - see detail above); two simpler panels are in St Katharine Cree. His work abroad includes an altogether more ornate monument to Charles Barton Burr (d.1821) in St Thomas's Cathedral in Bombay; also in India is his statue of Marquis of Hastings in Bombay. So far as his Classical and allegorical works exhibited at the Royal Academy go, these seem to have disappeared without trace. Hinchliffe had an artist son, John James Hinchliffe, who became an engraver and illustrator, mostly of landscapes.